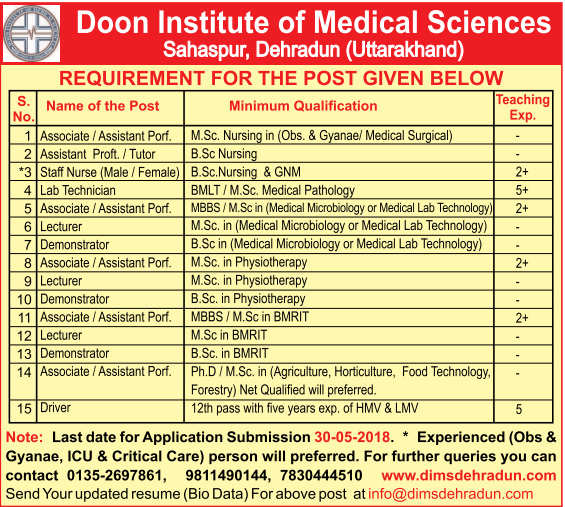 Doon Institute of Medical Sciences (DIMS) has released an advertisement for recruitment of Professor, Staff Nurse, Lab Tecnician & Driver. DIMS Sahaspur invites application from qualified candidates for multiple posts before 30 May 2018. Screening will be done from the applications received. Shortlisted candidates will be then called for the interview. On the basis of which final selection will be done. Help us to improve this article/job posting "Medical Professionals Recruitment in DIMS Sahaspur". We would be glad if you can comment below and provide your valuable suggestions and feedback. If this page have any wrong information/list or out of context content, then you can report us as well. Can i apply for the post assistant professor, i have done M.Sc. Microbiology. If you have any vacancy related to HR profile so please consider me for interveiw. I Have approx 6 year experience in same field and belong to Langha road near by sahspur. My contact number is 8057314633. CAN I APPLY MEDICAL LAB TECHNICIAN (B.Sc.M.L.T) MY CONTACT NUMBER 9675783388. Have any job of medical microbiologist? ?